SWIMBAITS → Soft Body → Live Target Threadfin Shad Swimbait 4-1/2"
Threadfin Shad are one of the most abundant and widely dispersed forage species and are a prime target of most freshwater game fish. 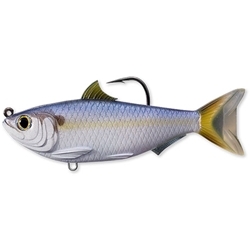 Fish the LIVETARGET Threadfin Shad Swimbait during the spring shad-spawn, in the summer when Shad school up, or during the fall, back in the creeks. Freshwater.